Chef Jon Fell describes his indulgent mutton recipe as "ridiculously over the top but well worth the effort". Truffles are optional but highly recommended - if you're lucky you might even be able to get hold of summer truffles foraged in Surrey and Sussex. If not, try replacing it with a few drops of truffle oil for that unmistakeable flavour. Soak the caul fat in cold water, then rinse, pat dry and cut into eight pieces. Melt the butter in a pan. Add the flour and cook out, then gradually add the milk to make a white sauce. Season to taste. In a frying pan with a little oil, sauté the mushrooms. If using, finely chop the truffle and add to the mushrooms (or add a few drops of truffle oil). Stir in the chopped chicken and bacon and allow to cool. 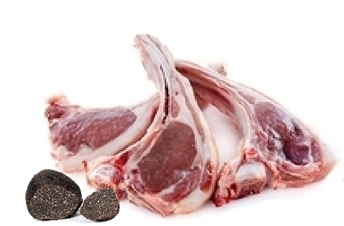 Place a tablespoon of the mixture on to each mutton cutlet, then wrap each cutlet in a piece of the pig caul. Beat the egg with a splash of milk, then dip each cutlet into the egg and then the breadcrumbs to coat. You can dip the cutlets more than once if preferred. Allow to chill for about an hour. Heat a little oil in a heavy-based frying pan and fry the cutlets being careful not to knock off the breadcrumbs. Continue to cook for about 10 minutes, turning frequently. Transfer to a warm plate and allow to rest for five minutes before serving.